Festive is exactly how you'll feel wearing this elegant new choir robe. 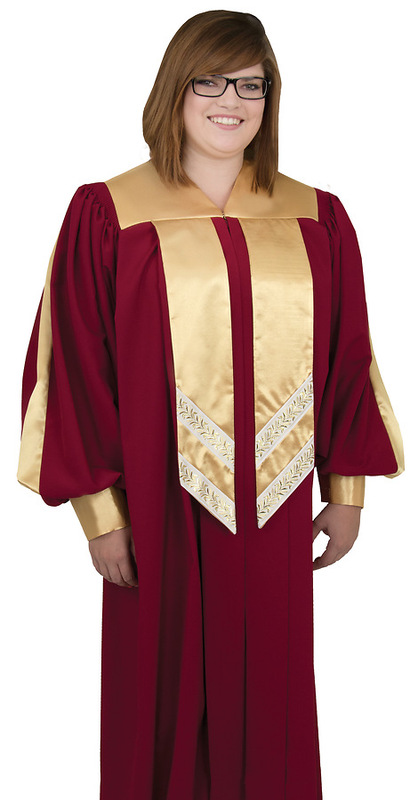 Tailored in chianti red Viva with gold Contessa® accents and ready to ship in 18 sizes to fit most adult and junior choir members. **Qwick-Ship robes typically ship the following day after factory receipt of order and credit approval if applicable. Please use the chart below to determine the correct size. If you need a different size please call our custom sales department at 1-800-237-7511. Also call about quantity discounts. CT-011 33"-37" 31"-34" 14" to 5'3"
CT-022 33"-37" 31"-34" 15" to 5'5"
CT-033 38"-41" 33"-37" 16" to 5'8"
CT-034 38"-41" 33"-37" 17" to 5'11"
CT-042 42"-45" 38';-41" 17" to 5'5"
CT-043 42"-45" 38';-41" 17" to 5'8"
CT-044 42"-45" 38';-41" 17" to 5'11"
CT-053 46"-49" 42"-45" 18" to 5'8"
CT-054 46"-49" 42"-45" 18" to 5'11"
CT-055 46"-49" 42"-45" 18" to 6'2"
CT-063 50"-53" 46"-49" 19" to 5'8"
CT-064 50"-53" 46"-49" 19" to 5'11"
CT-065 50"-53" 46"-49" 19" to 6'2"
CT-074 53"-57" 50"-53" 21" to 5'11"
CT-075 53"-57" 50"-53" 21" to 6'2"
CT-112 24"-27" 24"-27" 11" to 4'4"
CT-110 30"-33" 30"-33" 13" to4'10"